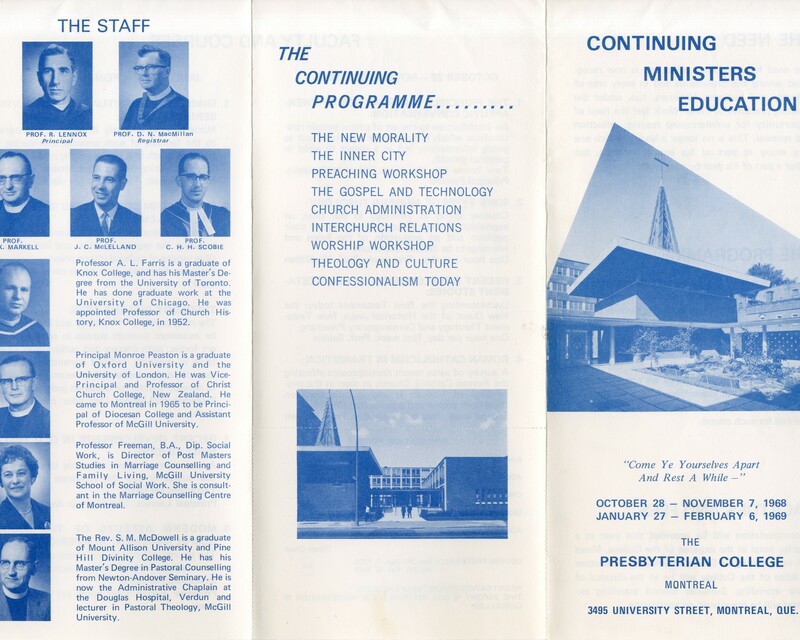 Following the opening of the new building the College would begin to focus on continuing education for their ministers beginning in 1965. 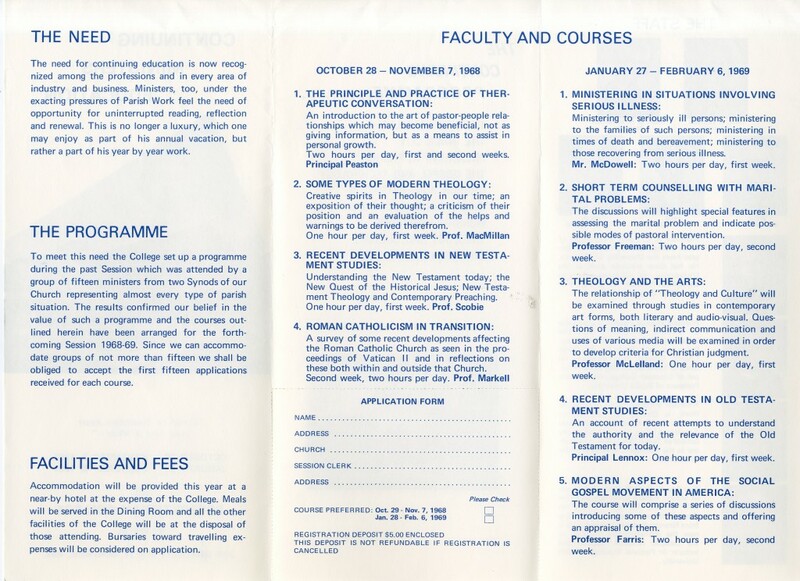 The classes were meant to introduce and develop ministers’ skills in dealing with modern situations. 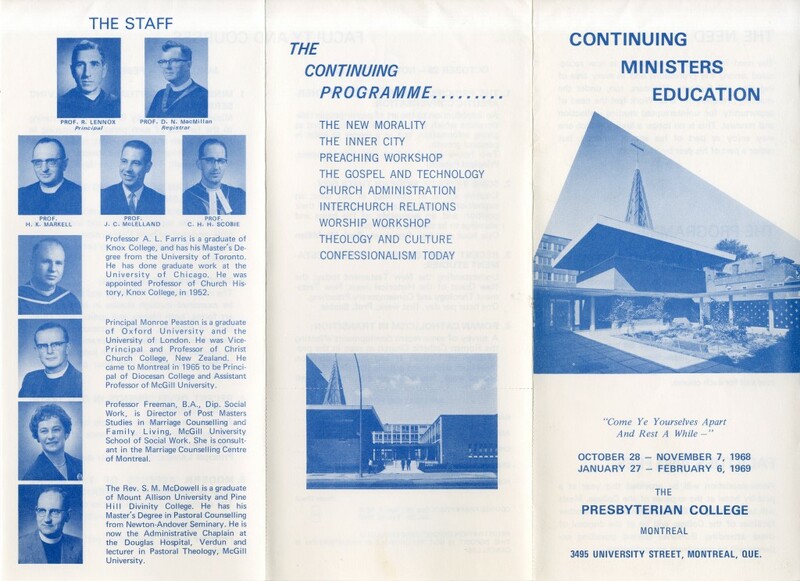 The offered courses dealt with situations that modern congregations and ministers might face. 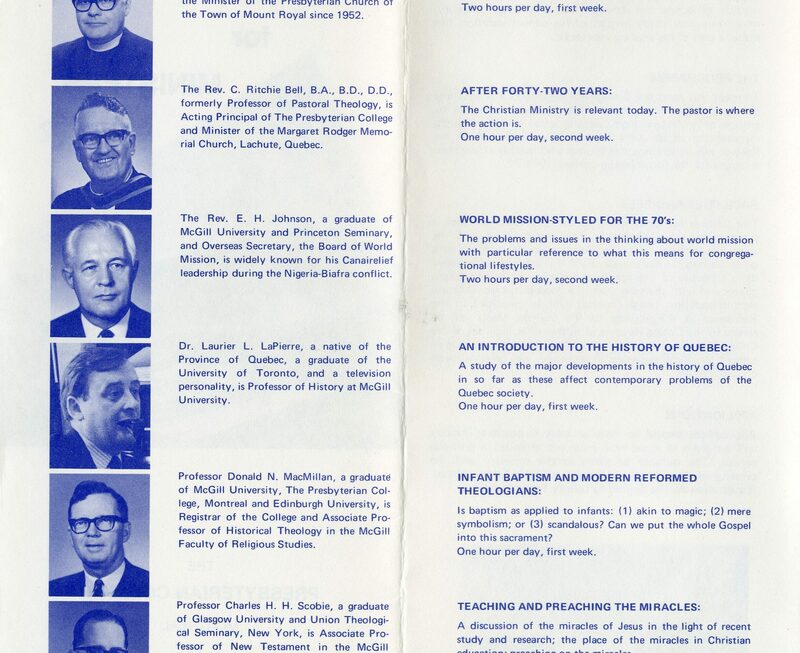 They included courses on new developments in theology, how to deal with people’s marital problems, and how to deal with members of the congregation who may have serious illnesses. 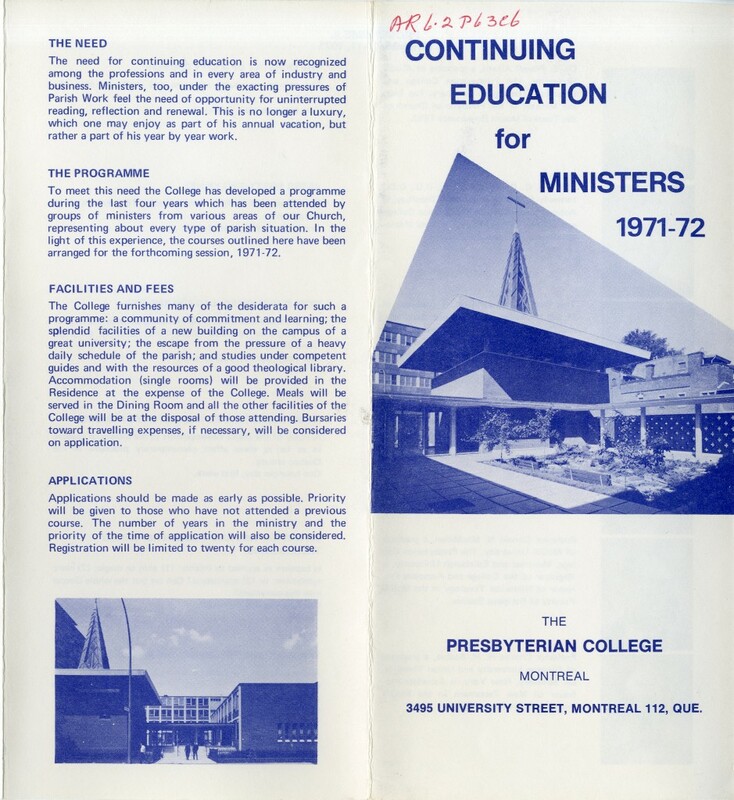 As the program grew more courses would be offered, and ministers would receive training not only from the faculty of The Presbyterian College but from members of the McGill Faculty as well. 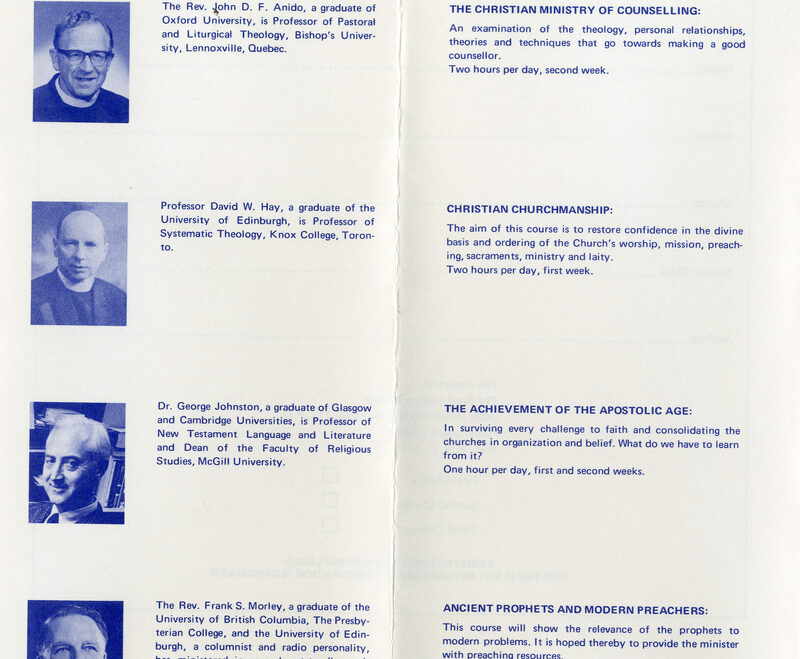 The year 1967 was also the hundredth year of teaching at the College. 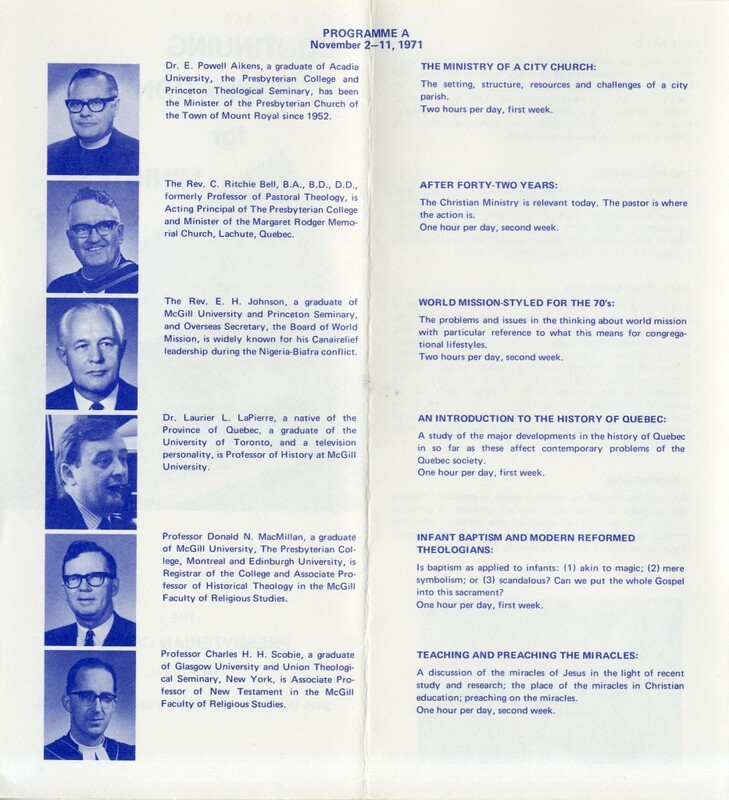 A special set of Anderson Lectures were held for the event as well as a special convocation ceremony to celebrate its 100 years. 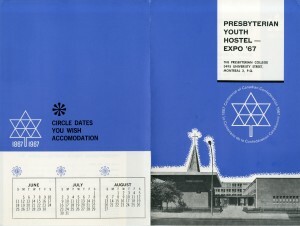 In 1967 the College would also open its doors for Expo 67’. 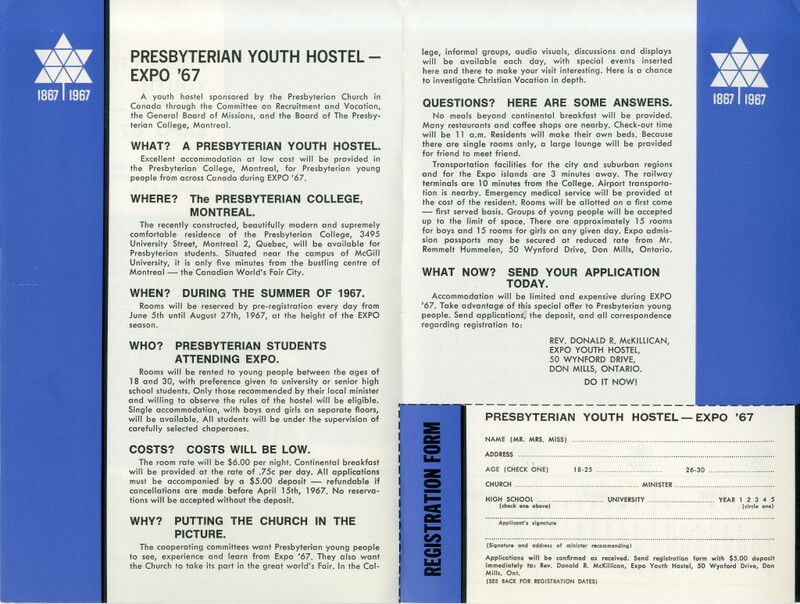 The College would develop a program for youth to visit and stay at the College. 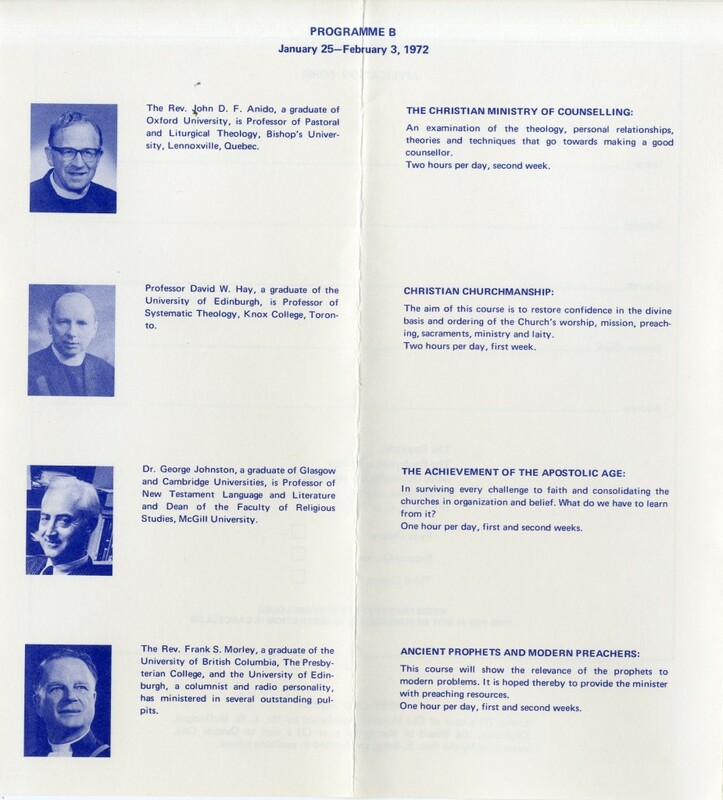 This was part of a larger effort to communicate the work of the Church and the College to a younger audience. 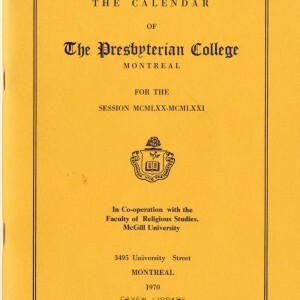 In 1969 The Presbyterian College would join the McGill Faculty of Divinity, and would reaffirm its affiliation with the University. 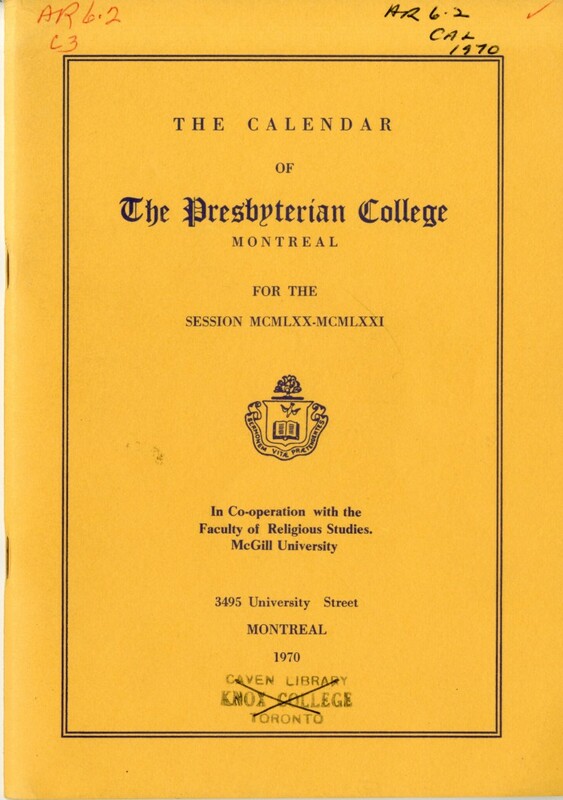 The College would once again join in cooperation with the other theological colleges of McGill. 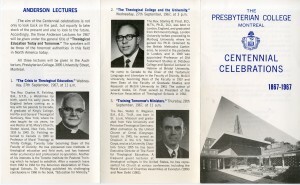 The College had distanced itself from cooperating with the Anglican and United theological colleges since Church Union in 1925. As a result, enrollment at the College went up for the next few years. It also allowed for the curriculum to be expanded and allowed for tuition costs to go down. 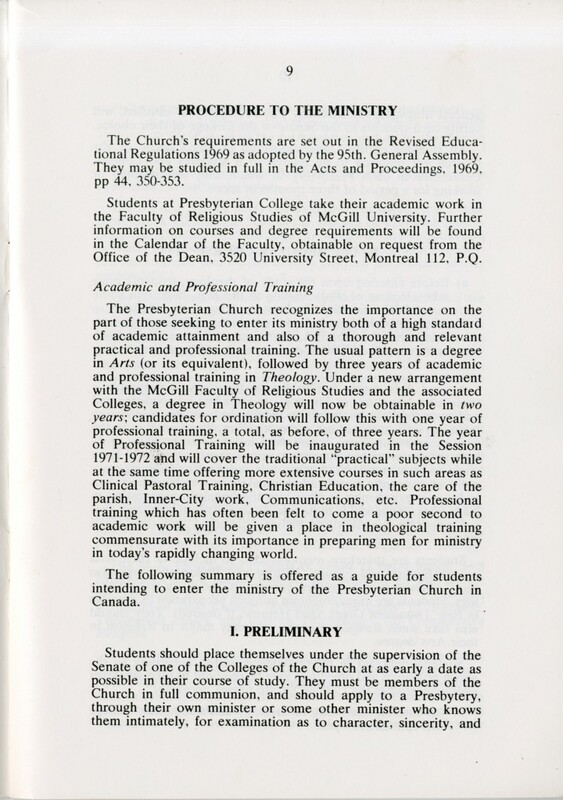 The administrative structure of The Presbyterian College would change during this time period as well. 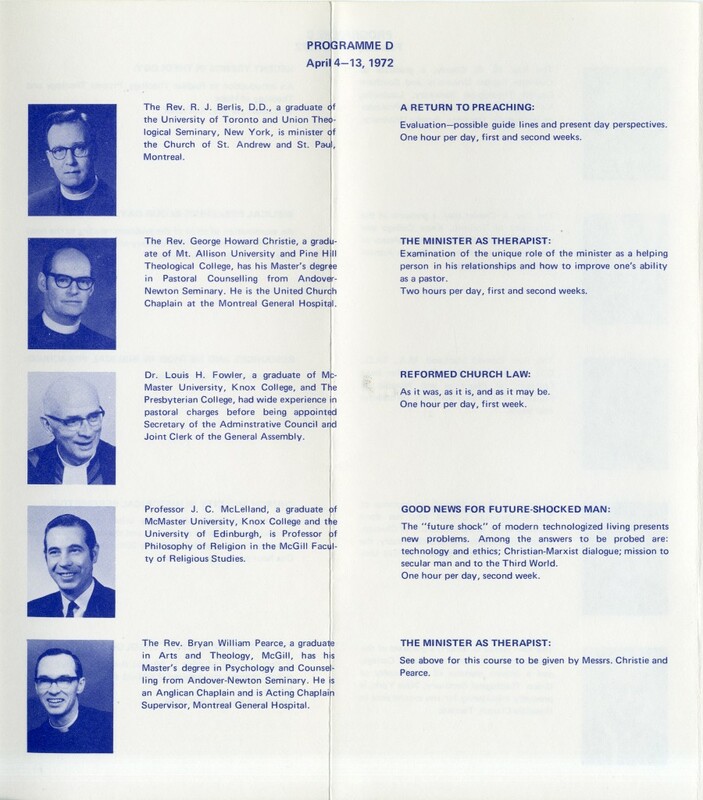 The Senate and Board of Management ceased to exist as separate entities in 1973 and were merged into a new Senate which was composed of both bodies. The curriculum and matters pertaining to administration were now handled by the new Board of Management. 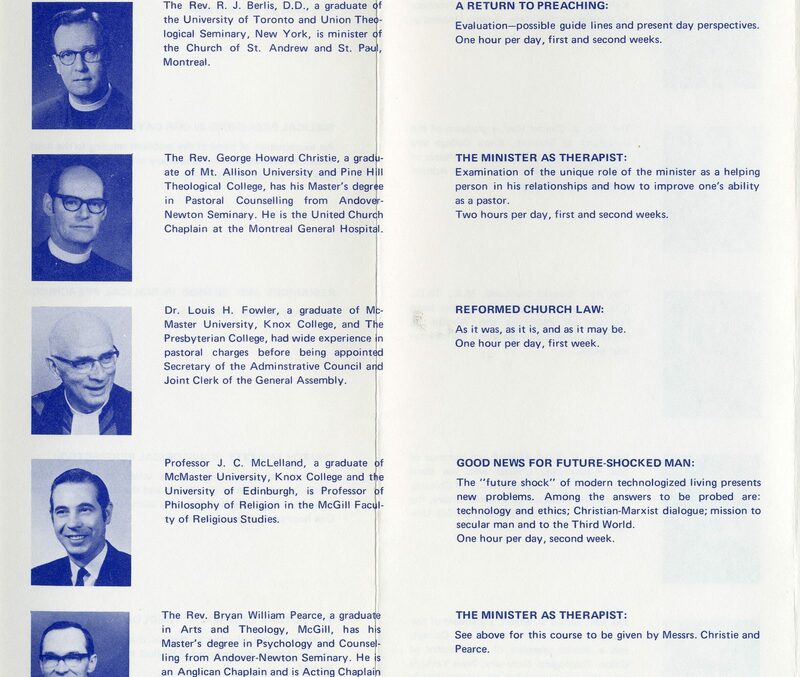 The old Senate structure was beginning to lose relevancy in 1969 with the joining of the McGill Faculty of Divinity. 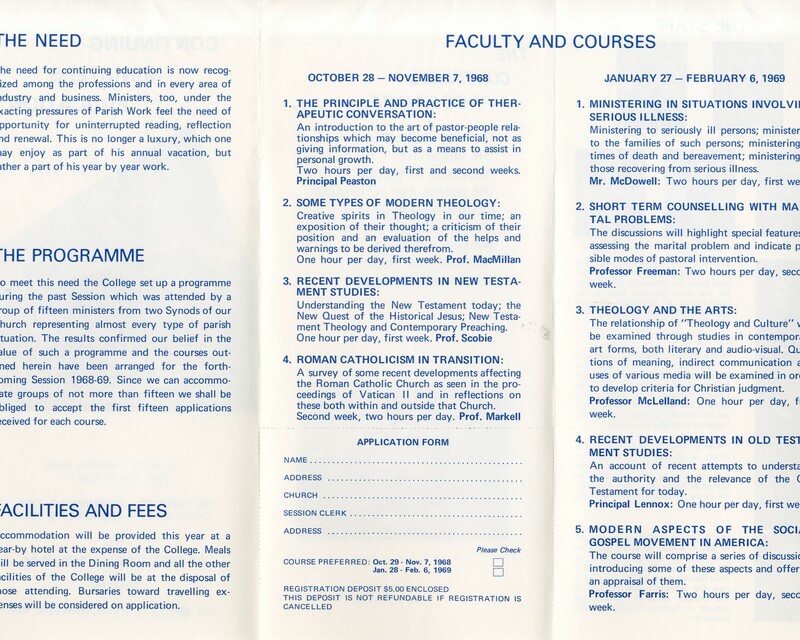 During the 1970’s the College would be run by two acting Principals Dr. C. Ritchie Bell from 1970-1973, and Dr. Donald N. MacMillan from 1973-1978. 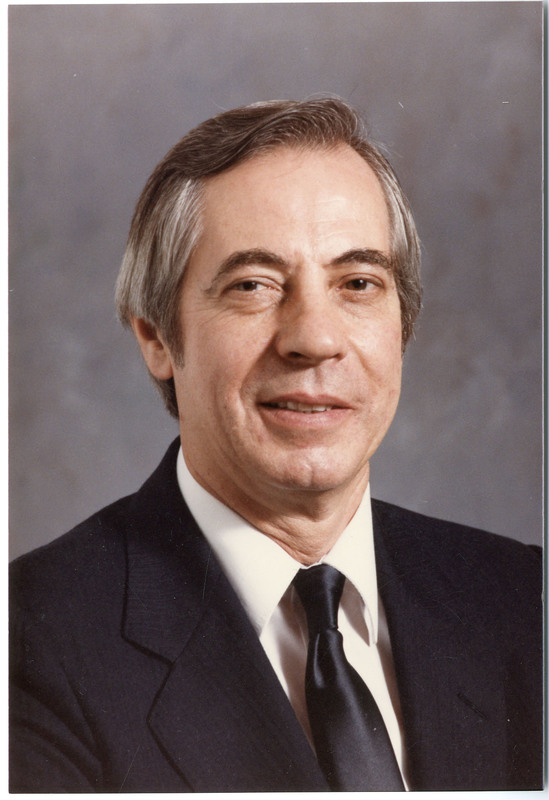 In 1978 Bill Klempa would be appointed Principal. 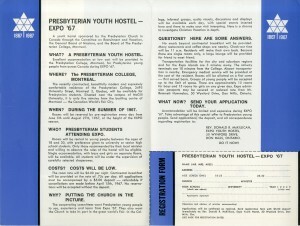 In 1979 The Presbyterian College would begin renting its extra rooms out to students from other faculties; a practice which is common with other theological colleges such as Knox College. 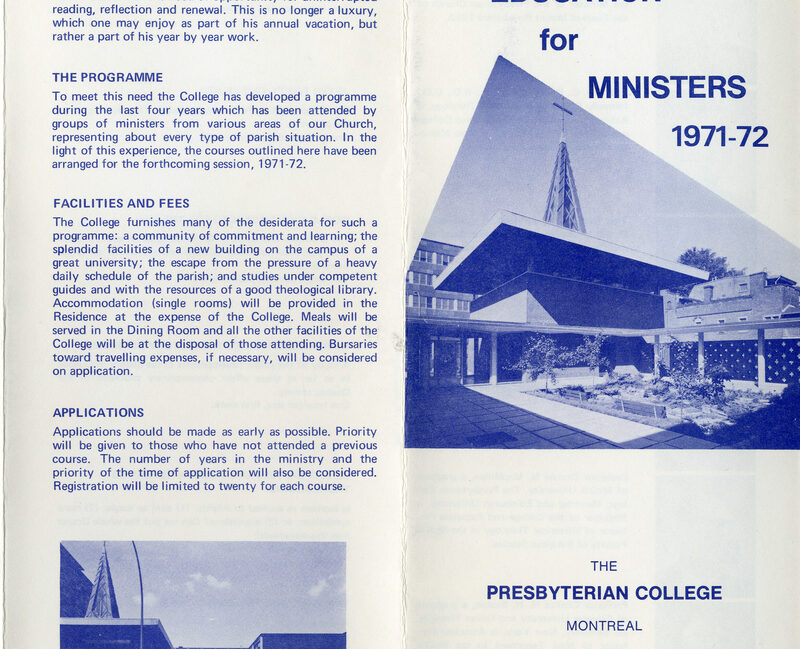 In 1980 The Presbyterian College along with Diocesan Anglican and the United Theological Colleges established a program of study for Francophone Protestants to earn University Degrees in theology. 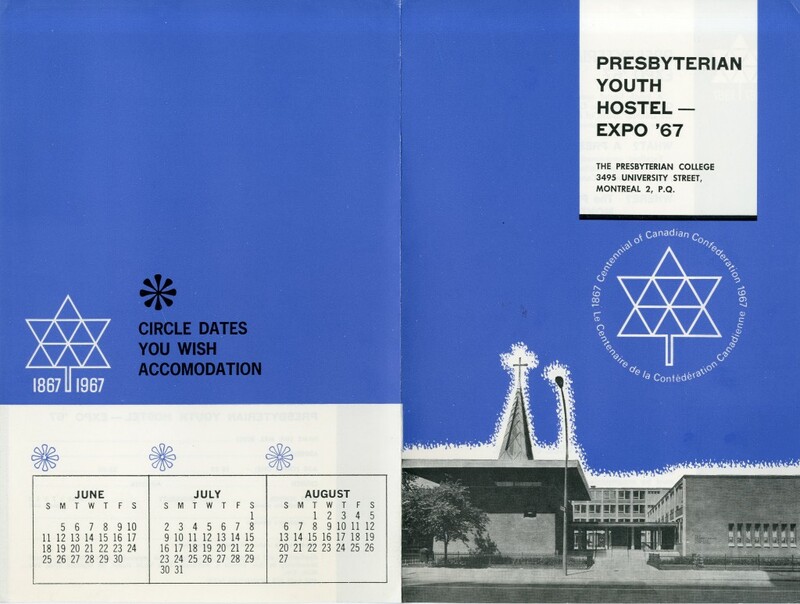 The Presbyterian College had not been active for quite some time in the teaching of Francophone Protestants. In 1980 Rev. 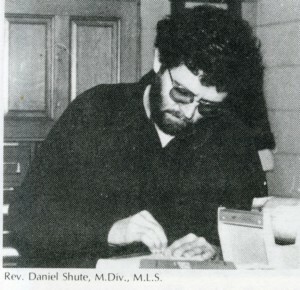 Daniel Shute took over as the Librarian of The Presbyterian College and was given full time status in 1984 and continues to serve the College today. 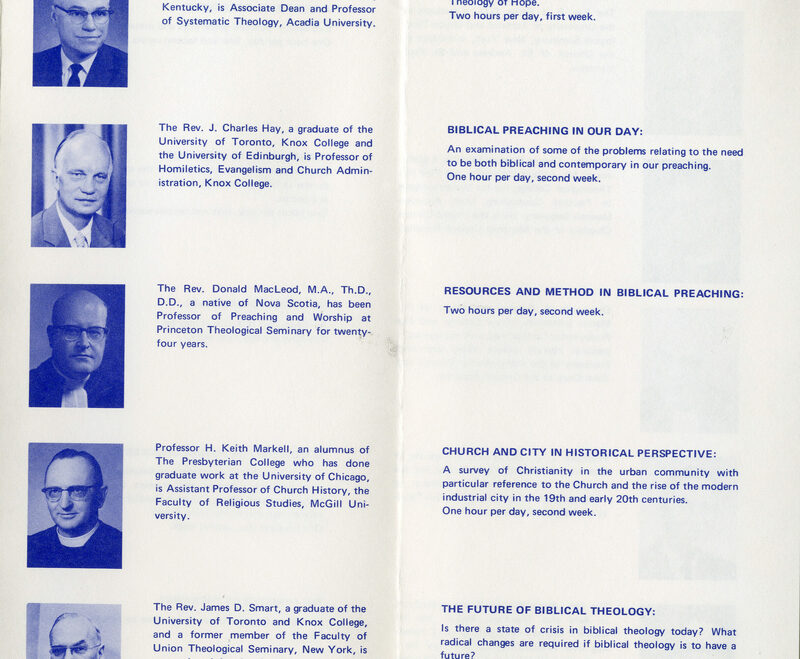 In 1981 The Presbyterian College would begin to confer Master of Divinity degrees through the Joint Board, which included the Anglican and United Theological Colleges instead of having to do it through the McGill Faculty of Divinity. Tragedy struck – the Chapel of the building was set on fire in November of 1990, but was rebuilt by 1991. In 1992 Professor Joseph McLelland became the longest serving professor in The Presbyterian College’s history. The year 1992 was his 35th year of service to the College, one more than MacVicar’s 34 years. Joseph McLelland is a distinguished member of The Presbyterian Church in Canada serving as Moderator in 1985, and as the Dean of the McGill Faculty of Divinity. 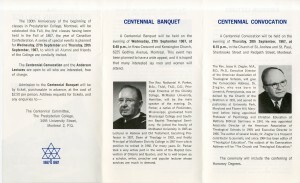 In 2007 the College Library would be renamed in his honor to mark 50 years of service to the College. 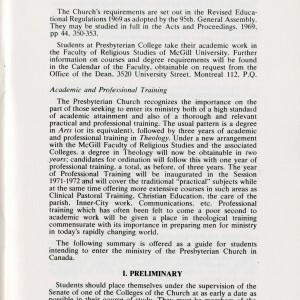 In 2002 The Presbyterian College would begin to offer a Diploma in Lay Leadership to members of the Presbyterian Church who were not clergy but wanted a theological education focused around leadership in church and society. The year 2005 was the first year of graduation for students in this program. 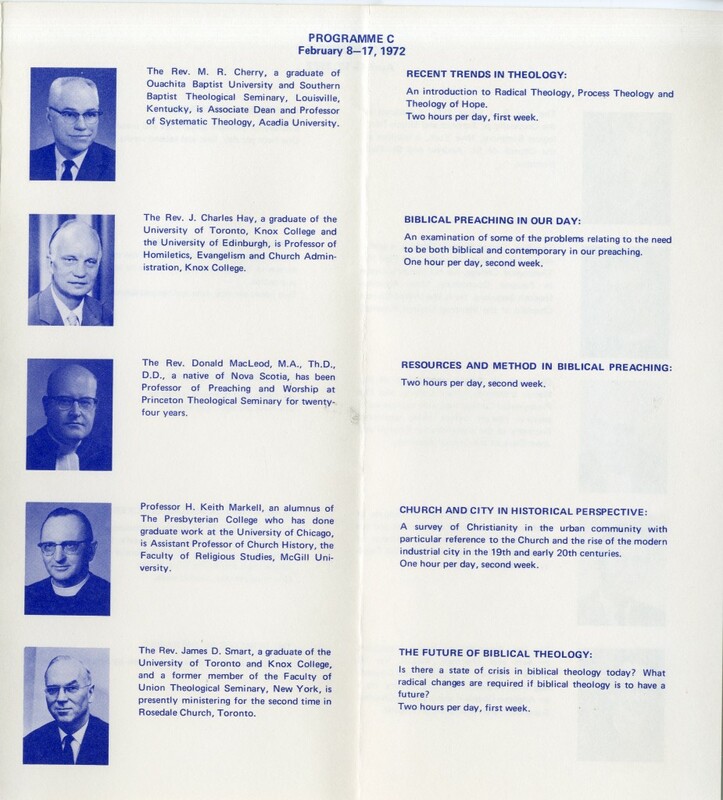 In 2010 the College’s Constitution was amended so it could confer the Master of Divinity and Master of Theological Studies degrees on its own.